Roger Friedman, who pens the mighty Fox 411 gossip fest, included a wee blurb in his column today that reports that the much publicized May 14 foreclosure auction for Neverland Ranch is full speed ahead. Now children, we got no reason to disbelieve the typically very well informed Mister Friedman...except for what we hear from Mister Plum, a seemingly well connected informant who whispers something a different in Your Mama's big ear. According to Mister Plum, The White Lady has miraculously managed to get Fortress Investment Group to once again restructure his massive loan on the forlorn and falling apart Neverland Ranch so that the former King of Pop can sell it privately to a group of LA based investors. Now go put on your thinking caps children, because this is where it gets even more confusing. Mister Friedman has repeatedly reported that an L.A. based investor named Jason Castero has put $46,000,000 into an escrow account and will likely be one of the bidders standing on the steps of the Santa Barbara County courthouse on May 14. However Mr. Plum, who claims to have connections at Fortress, says he's quite certain the foreclosure sale won't happen and there is another LA-based investment group that is NOT headed up by Jason Castero who is also making a play to purchase the property directly from The White Lady...that is IF the beleaguered and financially strapped Gloved One will sell the property. Here's the thing: Your Mama has a very, very difficult time believing that Fortress would be in any mood to want to work with Mister Jackson on this long defaulted on $24,500,000 loan. We simply can't figure out how a refinance on the 2,600 acre ranch is in their best interest particularly if they know that this Castero fellow and perhaps another group of cash rich investors are chomping at the bit to buy the property. So then we'll all have to sit tight until the scheduled May 14 auction draws near and then see how all this rumor and gossip will sort itself out and into a place of truth and reality. It seems to me like Michael Jackson has "played his way" for far too long--hence the reason he's in the mess he's in!!! I hope the foreclosure sale happens. Michael has very wealthy friends all over the world that love him for all of his contributions he has made and they are the bankers biggest customers so I am sure fortress will give him a break. bizness is bizness. Banks want there money. I hope the auction happens too because I will be in the area that day and would love to watch it all go down. I'll even capture it on video and send it to Mama so she can have finally have the Neverland fiasco closure she so deserves! I don't think MJ has any future earning power. I confess, went over for a listen to his re-release at Legacy Records; the seeming Siberia/farm team arm of Epic. God only knows what favors the label called in to get the big guns to duet with him. It's a lackluster marketing effort,too. Maybe producing this re-mix is what Legacy had to do to support a case of dropping him. The man has lost his voice. What now? For Anon 8:39AM--If you really do film the foreclosure proceedings, is there any way you could post in on here--or anywhere? I know there are lots and lots of people who would love to see it--including me!!!! Thanks! That Raymone Bain is just a Plum! Mama, way off topic: As you enjoy David Foster Wallace, let me recommend David Sedaris who is a delightfully sideways, verbal contortionist who is just so good. Sorry, folks, that's all. Aunt Mary, "Seasons Greetings to Our Friends and Family!!!" from Holidays on Ice is my all-time Sedaris favorite. Give him a break? Make's you wonder why none of his "friends" are stepping up - burning bridges hurt even the king of POP. Good for Michael Jackson!!! I wish him ALL the best. I never believed what Mr. Friedman had to say anyway. pch, too, too funny! David Sedaris's writing will lower your blood pressure 10-15 points. Promise. And have you whooping and snorting , he catches you so off guard. Oh please. Even if he restructures, he's leveraged to beyond the hilt and has no discernible means of paying back the loan. He can't even keep his Encino home, for pity's sake. Maybe he's hoping to win big on the slots in Vegas. If he were not in such a bubble world, he'd pull a Celine Dion and stay there, doing nightly shows for a gazillion dollars until he was solvent again. 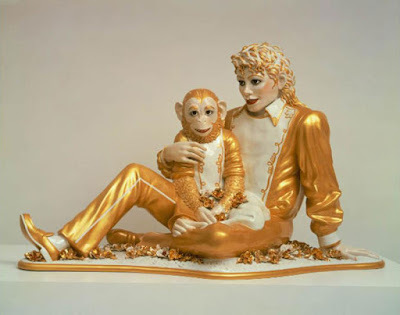 I don't know who's creepier,Jeff Koons or Michael Jackson? Janet is on Larry King tonight. The promo says she will talk about "family" and flashed up a photo of Michael. Wonder if she will address the Neverland fiasco? That statue is scary - and speaks volumes. Michale Jackson the king of pop has already sheltered in the hearts of people.Many of his friends,fans are wealthy and are able to bank for his projects with his experience he will defnitly succed. micheal jackson is not broke. He owns all his music plus the Beatles. He makes 40 million a year off the beatles catlog. Im sure he make milions from his own stuff. i dont know about you but I can live very well on 40 mil a years.